You have arrived at an archival site. The Universe Forum's role as part of NASA's Education Support Network concluded in September, 2009. Please visit NASA at http://nasascience.nasa.gov/ for current information about NASA's science, education, and public outreach activities. Where are we in the universe? Take this cosmic tour and find out! The Big Bang is the universe's earliest known event. What powered the Big Bang...and what came before it? They are nature's strangest creations. What happens to space and time at the edge of a Black Hole? A mysterious new form of energy seems to make up most of the universe. What in the world is it? We offer a broad educational experience to support the exploration into the greatest mysteries of the universe, for educators, scientists and students alike. Go there. NASA's exploration of the universe is ongoing and getting more exciting all the time. Take a look at the space missions that are on the cutting edge of discovery. Go there. 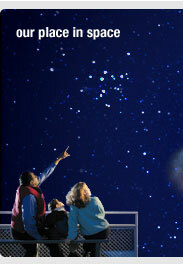 News from the cutting edge of discovery as well as your opportunities to explore. See what's happening in the universe now! Go there. The Universe Forum is one part of a nationwide NASA education team exploring all aspects of space science and space exploration. Find out more about who we are and what we do.